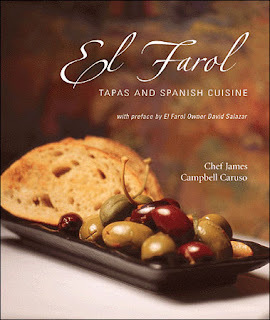 My El Farol Cookbook arrived in the mail yesterday and I am impressed! I already made one of the recipes and it turned out great! Mind you it was just a salad of grapes, tomato, olives, mozzarella, and various fresh seasonings and dressing, but it was delicious. I had planned on making the curried chicken salad to see if it would taste as good as it does at the restaurant, but I could not find coriander seeds at either shop I went to. It was obvious that Whole Foods normally carries them (there was a slot for them), but they were out. The best part of this cookbook is that all the recipes I read through seemed incredibly easy. Also, there was none of that weird cooking lingo that I find in some cookbooks and totally don't understand. I can already say that of all the cookbooks I have (and I have lots of them) this one is already my favorite due to the simple recipes and assuming the recipes all come out tasting as good as they do at restaurant this book will get a lot of use.